Valuatum provides you Valuatum Estimator, a powerful business valuation tool for valuing and analyzing your company. The key features listed below combined with continuous support and development ensure that you receive a business valuation effortlessly. You can also watch a preview video of Valuatum Estimator below. Our business valuation and analysis system is one of the most reliable and agile solutions in the market and therefore suitable for both professional organizations and individual users. The process of obtaining a valuation estimate is designed to be as simple and reliable as possible. 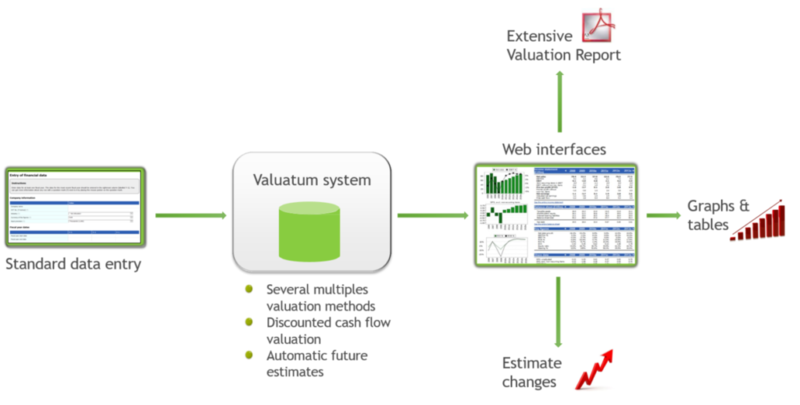 Valuatum system creates a valuation estimate using several multiples valuation methods. Our business valuation tool utilises many commonly used valuation methods to calculate the value of the company. Historical figures, industry data and future estimates are combined to ensure the reliability of the valuation. The specific methods and their weights in the final valuation are determined dynamically based on the financial situation of the company. The use of the various methods is thoroughly explained in the generated report. For further information about company valuation, please see the Valuation methods page.